And then there were 12. 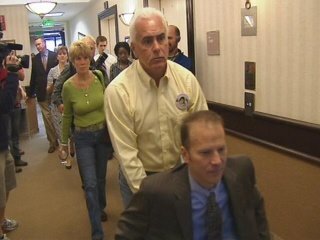 The first 12 jurors, out of 20 required, have been selected in case of The State of Florida v. Casey Anthony. 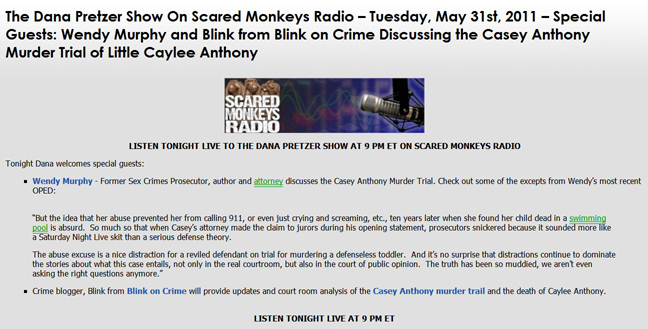 The week in review- Blink discusses LIVE on Scared Monkeys Radio, The Dana Pretzer Show Tonight at 9 PM Est. Orlando, FL– Brad Conway, counsel to George and Cindy Anthony, has resigned. Has Jose Baez, the defense counsel for alleged child murderer Casey Anthony had his first good idea by providing more inaccurate information for a motion on behalf of his client? Seems to me rendering the object of your defense strategy, lawyer-less, works in her favor. He is the 3rd attorney to withdraw from representation of the Anthony’s behind Paul Kelley and Mark Nejame, respectively. The resignation comes following a week of terse publicly released emails between Cindy Anthony, Mark Nejame, Brad Conway and Jose Baez. With regret I am forced to resign as George and Cindy Anthonys attorney. The defense motion filed on August 9, 2010 contains allegations that are not in fact true. As an officer of the court I cannot stand idly by knowing allegations involving me have been misstated. I am now a witness to an innacurate legal pleading filed in our court system. As such, I cannot continue in good conscience as a legal representative. George and Cindy Anthony have done nothing improper, it is the failure of the defense to verify the facts alleged in their motion that forces my withdrawal. I will continue to support the Anthonys, will continue to attend hearings and the eventual trial and most importantly I will continue to search for the full truth regarding the killing of Caylee Marie Anthony. Orlando, FL– In a word, YOWZA. I freely admit I have caught many a fly in my trache while my yap was left hanging open at some of the legal filings by Jose Baez et al, in this case. The latest motion to suppress the recorded conversation between convicted felon and “lifer” Robin Lunceford and Jose Baez has insipred the first ever Blink Darwin Award, or, THE BLARWIN. In his Motion for a protective order to keep the call out of discovery, Esteemed Blarwin recipient, Jose Baez, claims he did not know his conversation was being recorded, and apparently, what type of phone line was being used although he states the call was transferred to his cell phone. Incoming telephone calls for offenders will not be accepted. In the event of family emergency (such as serious illness or death in the family) you may contact the chaplain’s office. The chaplain will notify the offender. Offenders, except those in administrative confinement, disciplinary confinement, close management or on death row are allowed to make collect telephone calls. Offenders are allowed to place up to 10 telephone numbers on their authorized phone list. If the offender has not placed your number on the list, he or she cannot call you. If someone already on the list changes his or her phone number, the offender can have the new number placed on the list. If an offender gets married, he or she can have the spouse added to the list. All telephone calls are limited to 10 minutes and are subject to monitoring (except legal counsel). 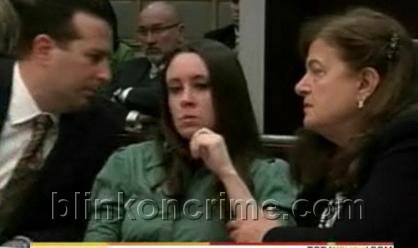 Orlando, FL– 5000 new pages of discovery in the murder case against Casey Anthony are due to be released this morning. Blinkoncrime.com will feature links to the docs when they become available. Check back to blinkoncrime for case analysis discussions.